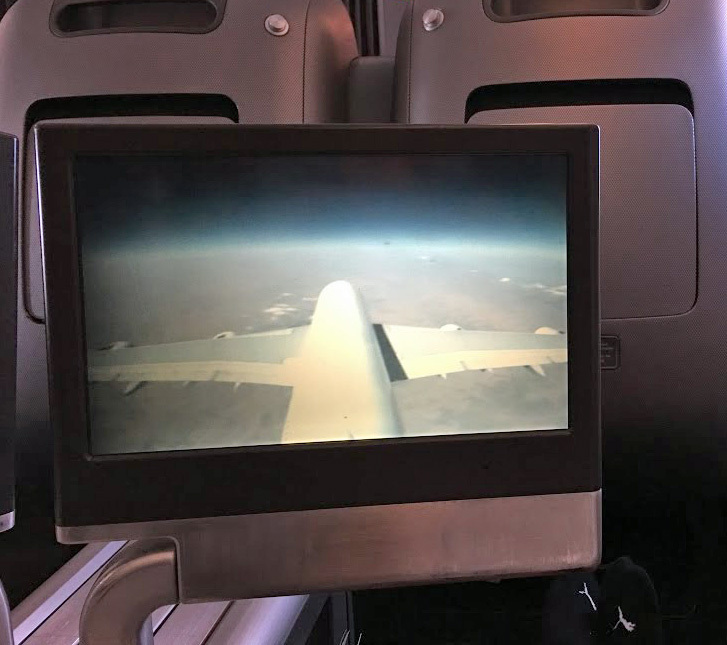 Qantas provides a comfortable business class experience on its A380s, but not at the standard set by some of its competitors. The key problem is the outdated seat design – something the airline will address with an A380 refurbishment program starting in 2019. 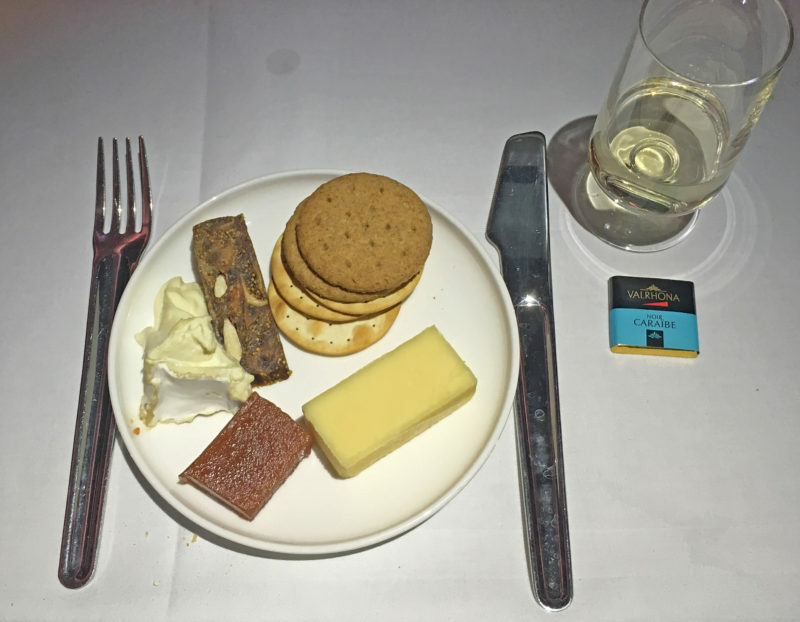 Despite this, I quite enjoy flying Qantas business class, mostly because the crew tend to be quite friendly, and the drinks and dining solid. 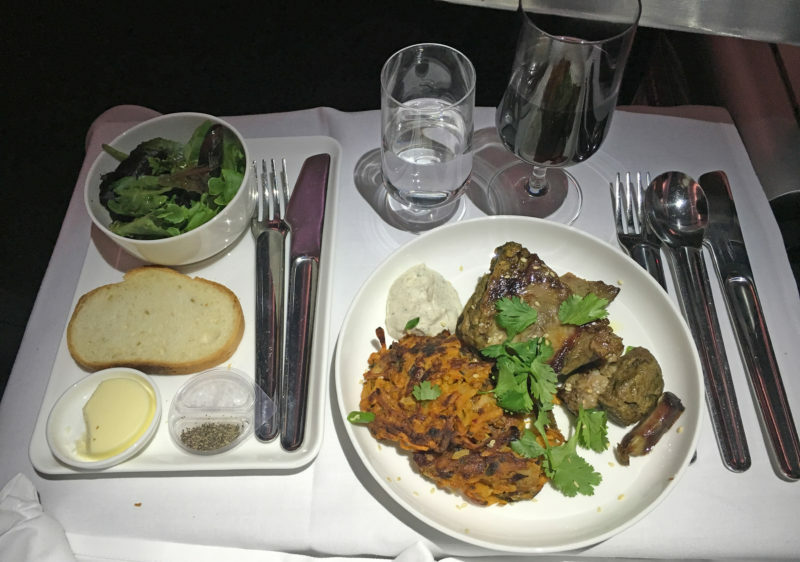 I would recommend flying Qantas A380 business class to travellers, though on some routes there will be higher quality options, so it’s worth researching before you book. Here’s my review of a recent flight from Dallas Fort Worth to Sydney. Qantas operates from the modern and newish Terminal D at Dallas Fort Worth (DFW) airport. The terminal was very quiet when I arrived three hours before the flight, which meant check-in and security clearance were a breeze. I was happy to be approaching the Qantas lounge within minutes of arriving at the airport. Sadly, the Qantas lounge left a lot to be desired. Qantas doesn’t actually operate its lounge at DFW, instead relying on a third party, and it shows. 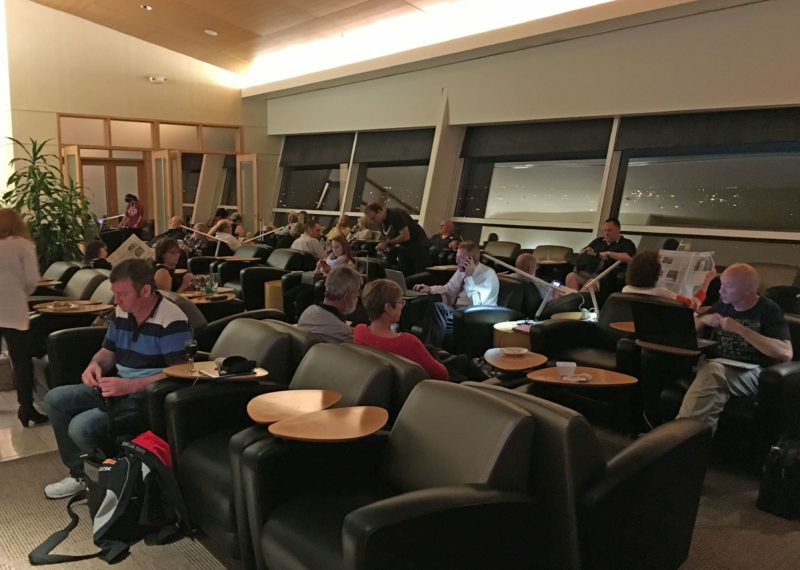 A modest selection of food and drinks was available (some hot food, salads, snacks and a limited range of wine, beer and non-alcoholic beverages), but the lounge was dated and cramped, and the staff provided the bare minimum level of service. What I really didn’t like, however, was the bathrooms. I was desperate for a shower after a whole day of driving and was shown to a grimy bathroom with a sink tap that didn’t work. I told the staff, who already knew about it, but didn’t seem to care. It was not a pleasant experience. 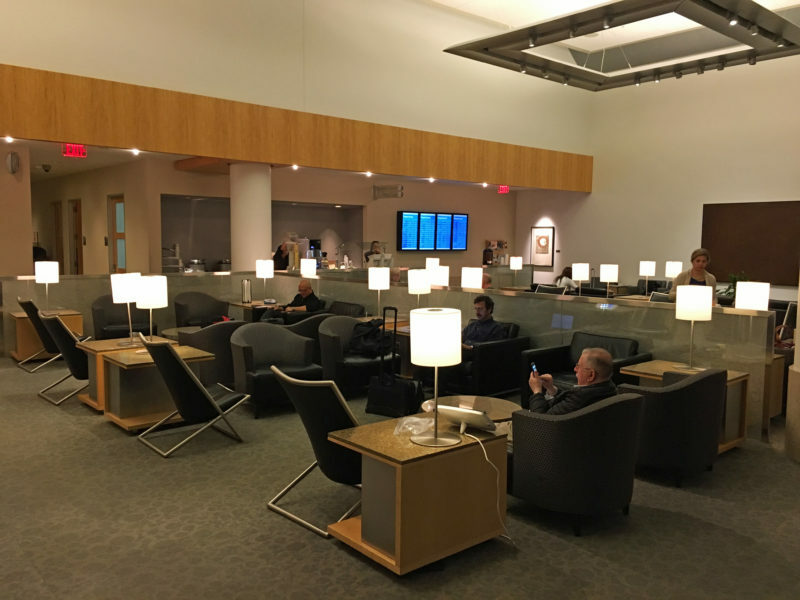 I decided to head over to the nearby American Airlines Admirals Club, which most Qantas passengers can also access (not that many seem to know). 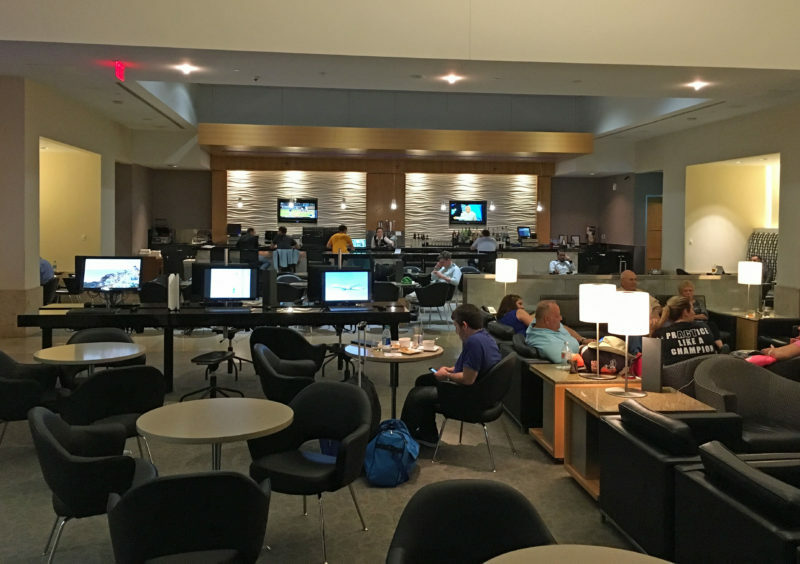 The Admirals Club is newer and much more spacious (and with much nicer showers!). 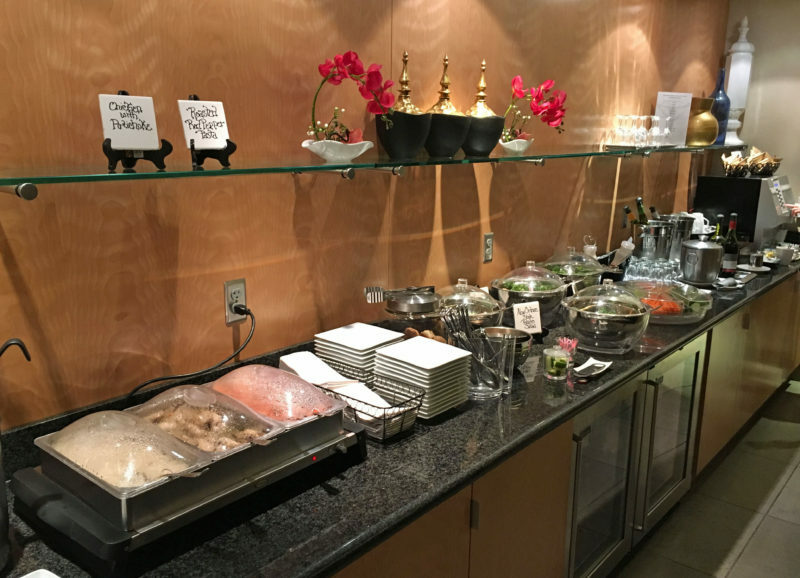 The Admirals Club has its own limitations with food and drinks, however. Upon walking in, I was surprised to be handed a couple of drinks vouchers and then to see a price list (!) at the bar. The bar staff never asked for a voucher, though, despite going back for drinks several times, which was confusing. There was some basic snack food available for free like soups, dips and crackers, with more substantial meals for purchase. Comparing the two lounges, I would definitely recommend passengers choose the Admirals Club over the Qantas lounge. You should be able to get in if you’re flying in business or first class, or have Qantas Gold or oneworld sapphire status. At the end of an overseas trip, it’s always great to be welcomed by Aussie accents onto the plane home. A cheery Qantas crew can make you feel like you’re almost there, even though you’re half-way round the world and facing a daunting 17-hour flight (the world’s longest, at one point). I find that Qantas customer service standards are consistently high. I especially like it when the crew mix professionalism with an easy-going, fun and attentive service, and so it was on this flight. The crew were professional but relaxed, very quick to respond to requests and really pleasant to deal with. The cabin was around half full, making the job easier for the crew. 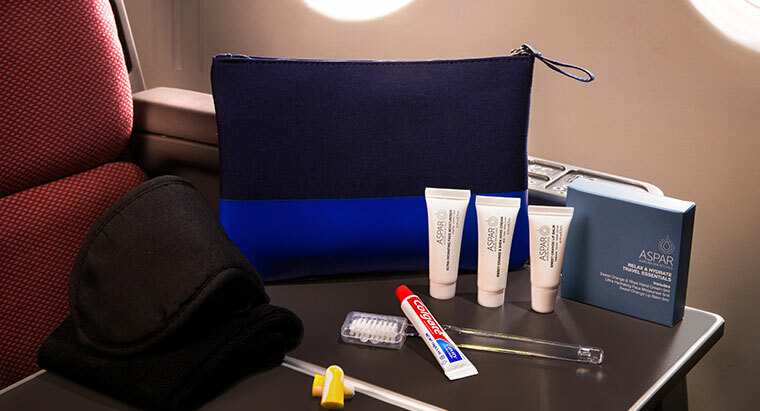 We were welcomed on board with a greeting and a drink, and were given pyjamas (see the image at the top of the post) and amenity kits (pictured below). 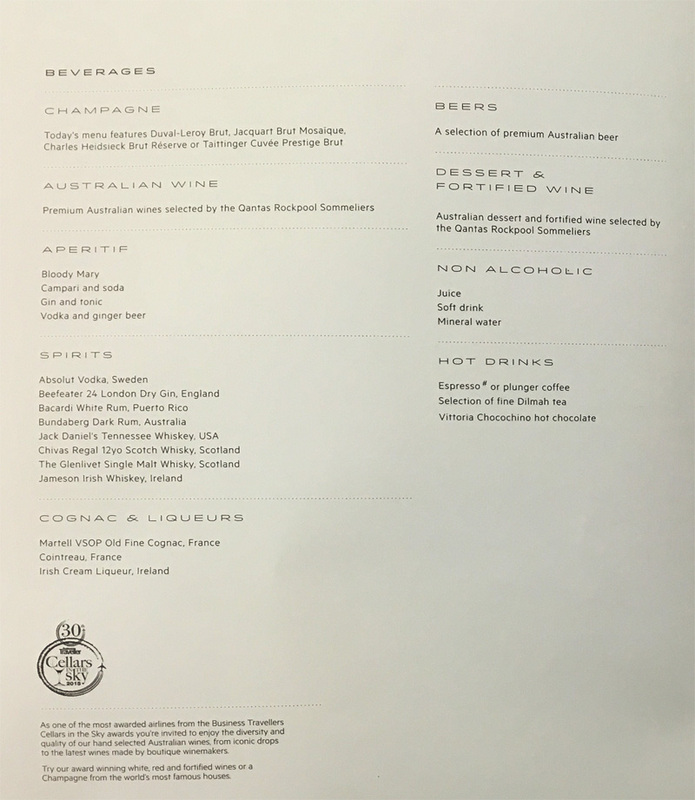 There are 11 rows of business class seats on the Qantas A380, with the first 3 rows in a ‘mini cabin’ up front (usually reserved for elite frequent flyers) followed by a galley and toilets, and then the other 8 rows. I sat in one of the centre seats in row 17 and found there were both positives and negatives with the seat. On the positive side, the seats are fully lie-flat and very comfortable, with lots of leg room (78-inch pitch) and a decent 21-inch width. The seat controls were simple to operate, with a massage and lumbar support option. The seat was very comfortable for sleeping on this long, overnight flight, with good padding and an extra mattress the crew attached soon after take-off. A cotton doona and multiple pillows provided additional comfort. When fully flat, the headrest is inside the shell of the seat, which provides decent privacy, and there are also dividers between the seats. 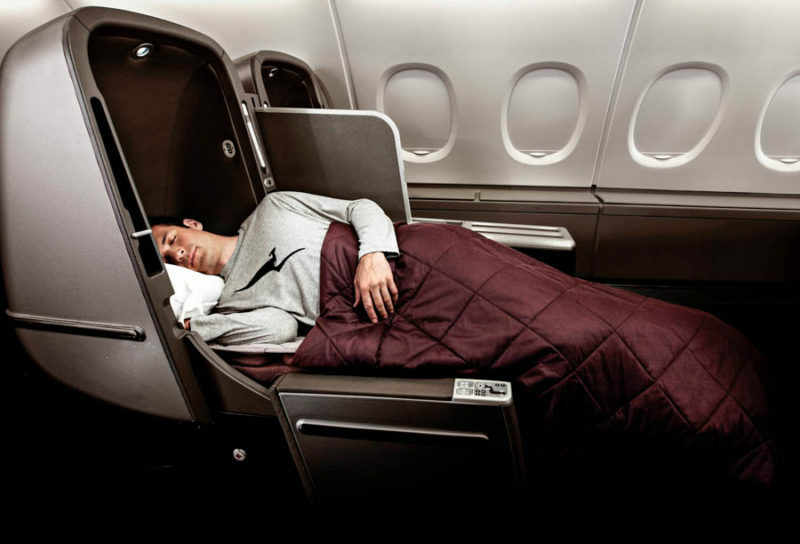 I thought the seat was more comfortable for sleeping in than the business class seats I recently experienced in an Emirates A380 and Cathay Pacific B777 (though both those business class products were better than Qantas overall). On the negative side, the 2-2-2 layout doesn’t match the standard set by other premium airlines now offering a 1-2-1 layout. It’s definitely not ideal for a solo passenger stuck in a window seat while the person next to them is reclined. The storage space was also very limited in the centre seats. I struggled to comfortably store within reach the ‘basics’ like a water bottle, headphones, iPhone and a few small personal items, which was annoying. I noticed that the window seats had extra storage next to the cabin wall, which would have come in handy. Upon boarding, the crew offered passengers a welcome drink of water, juice or champagne. I had a glass of champagne, which was the Duval-Leroy Brut NV – not a bad drop. After take-off, it took more than an hour for the drinks service to begin, which is a bit too long. I’m not sure if this is usual for Qantas International but based on my experiences with other airlines it shouldn’t take longer than 30 minutes – especially with a half-empty plane. There was a decent selection of drinks on offer including several champagnes, two red and two white wines, as well as spirits and various non-alcoholic beverages. I stupidly didn’t take a photo of the wine list, but I know I had a glass of the Innocent Bystander Pinot Noir over dinner. Here is the rest of the beverage menu. 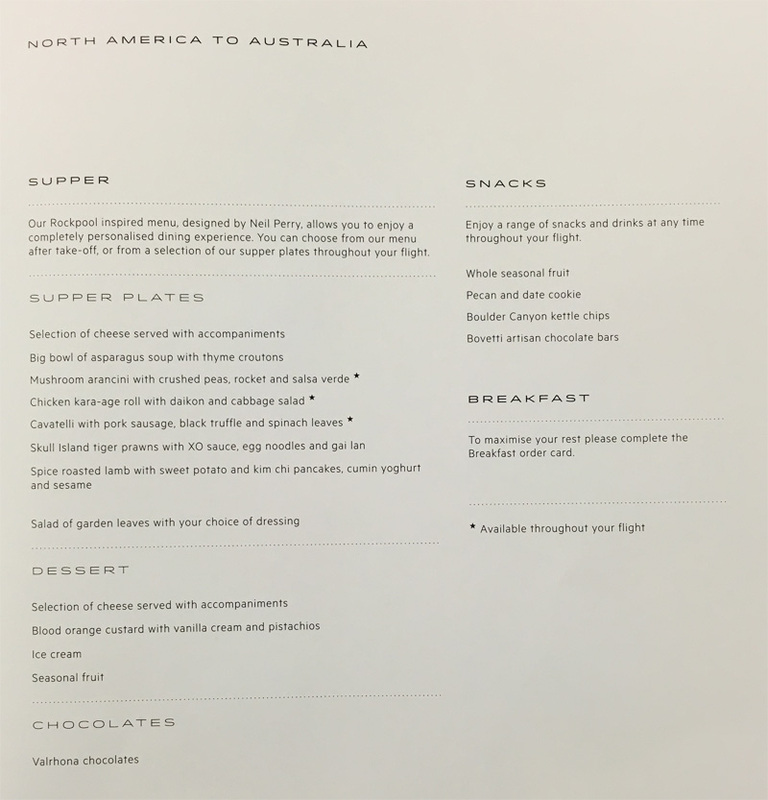 The Neil Perry ‘Rockpool inspired’ food menu featured a selection of “supper plates” allowing passengers to design their own meal, with some plates also available throughout the flight. 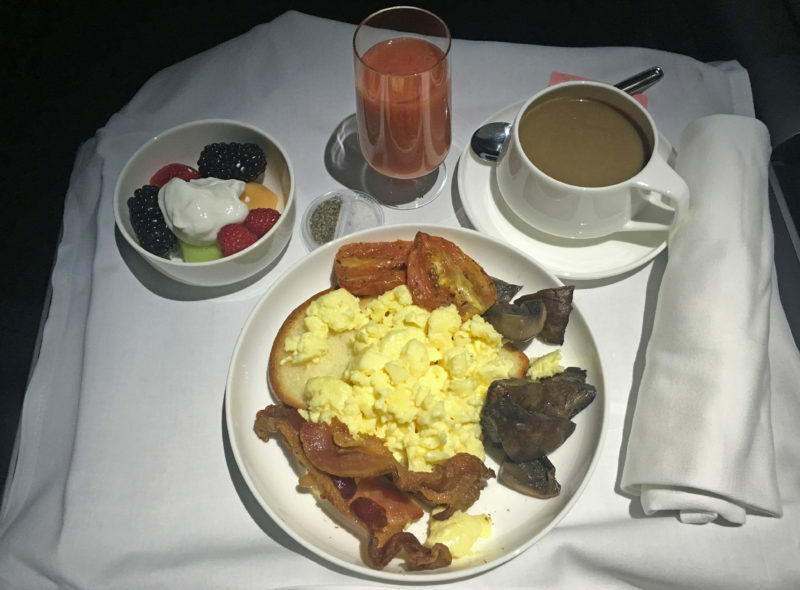 This makes sense as many passengers will prefer to have a light meal and go to sleep, and have some food upon waking. I chose the spice roasted lamb with sweet potato and kim chi pancakes, which tasted great. To follow, I had some cheese and weird-looking crackers. 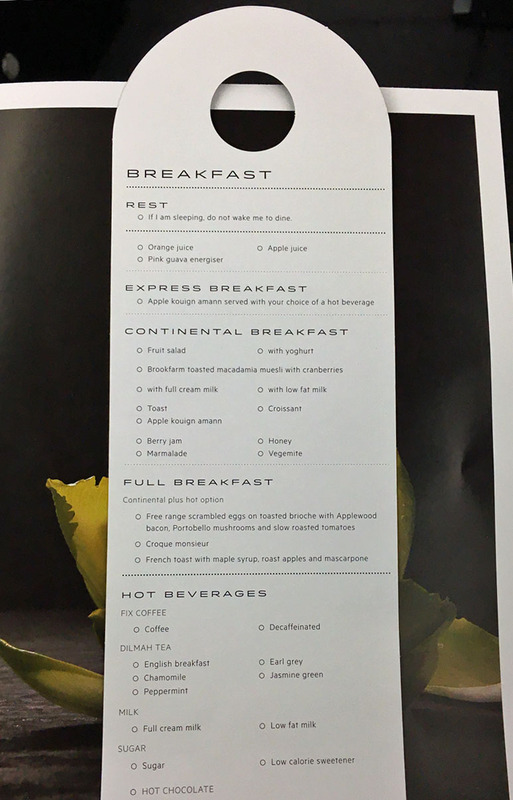 The crew requested all passengers to pre-order breakfast before going to sleep, with options including a continental and/or cooked breakfast. The cooked breakfast was delicious and the highlight of the food and drink service. The eggs were fluffy, the bacon was crisp and the “pink guava energiser” juice a real winner. I should add there was a small breakout area at the very front of the upper deck with self-serve wine and snacks available throughout the flight, though I didn’t make use of it. It looked pretty cramped and I didn’t notice anyone else there during the flight, so I don’t think it’s used very much. There was an extensive selection of films, TV shows, radio channels, music albums and games available on the flight – enough to meet anyone’s needs on such a long journey. In terms of films and TV shows, there were both recent releases and older classics. Passengers who want to bring their own entertainment can also make use of the PC power and two USB ports at each seat. The 12.1-inch touchscreen worked fine, though the size and quality are disappointing – probably the worst I’ve seen long-haul on a premium carrier. The screen popped out of the console and could be swivelled into position. I enjoyed this flight, which was comfortable and featured great service by the crew – but as as I’ve pointed out, there is a lot of room for improvement in the seat design. 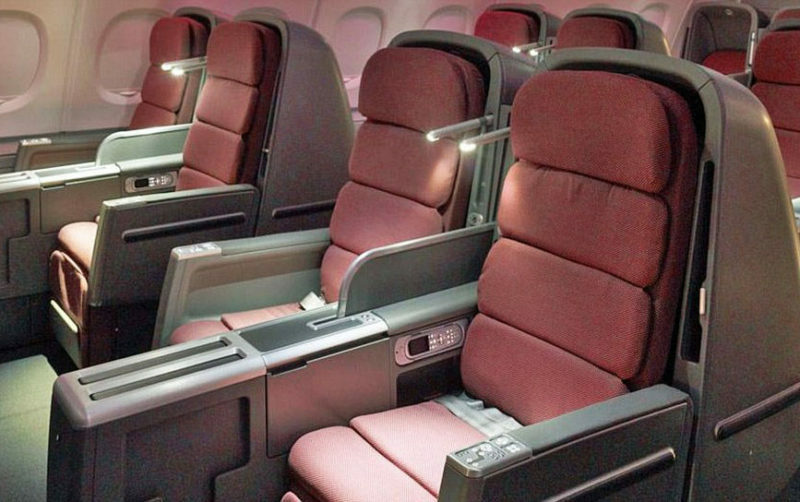 Qantas is setting a higher standard in business class on its recently-upgraded A330s and forthcoming B787 Dreamliners, and the announced refurbishment of the A380 fleet can’t come soon enough. 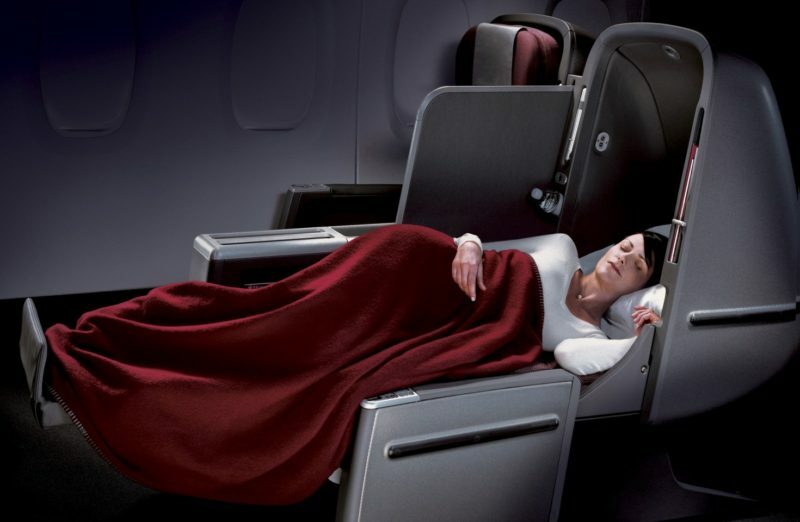 I would recommend this flight to loyal Qantas frequent flyers, though there are better business class options on some routes the Qantas A380 flies. Hi Kris, thanks for your great review. My husband and I are flying qantas business class to L.A. then home via Dallas to Sydney so this was great advice. We have window / aisle seats in the mini cabin from Dallas. We used 198,000 points each and about $1000 per person in taxes. So looking forward to being comfortable on that long flight home. Maybe we will be in an upgraded A380. Either way im happy to be able to lie flat to get some sleep. 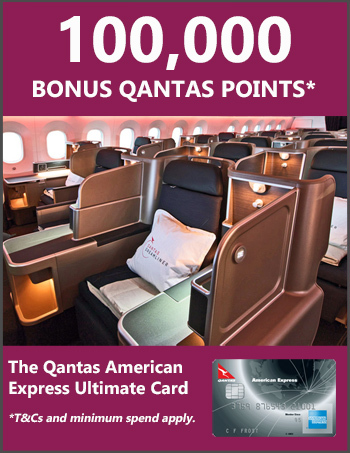 Another example of the side chasm that exists between Qantas brand and reality. The product is severely dated.